The International Energy Association (IEA) has published a very nice special paper with the title Energy Poverty: How to Make Energy Access Universal. This report makes a substantial contribution to the work on energy poverty and provides the updated figures on electricity access and the use of fuels for cooking. The purpose of the report is to raise the issue of energy poverty to a higher level of international visibility. This is quite a welcome tact by an energy agency that for many years has specialized in addressing issues of modern energy. I really like several things about this new report. For one, the energy access and cooking fuel issues are well documented and nicely presented in tables and figures. They also have made this publication free as supplement to the World Energy Outlook. However, if you want the more country specific details you must purchase World Energy Outlook. Finally, IEA has now added cooking fuels to the other types of energy they track to compliment their emphasis on electricity and other modern fuels. This will raise cooking fuels to a higher level of public awareness and tracking their use is a very good idea for policy makers in the field of energy. The report also has some very high figures for the investment costs necessary to reach universal modern energy access by 2030. At first glance, I thought these figures were too high, so I decided to “look behind” the figures. I can tell you that that even for someone as seasoned as me this was not an easy task. The report estimates the total new household electricity consumption per month from 2010 to 2030 that would be necessary to reach universal access. This new consumption is beyond what they call the “new policy scenario” that is actually an accelerated scenario for possible reductions of greenhouse gases. According to the report, the the additional households that would be provided with electricity under the universal access scenario for 2030 would consume and additional 952 terawatts hours of electricity and require new capacity of 250 gigawatts of generation. This is based on the number of households above and beyond the “new policy scenario” expansion between 2010 and 2030. The investments necessary by 2030 for reaching universal electricity access is about 700 billion dollars and this figure includes generation, transmission, and distribution for grid, offgrid, and household systems. 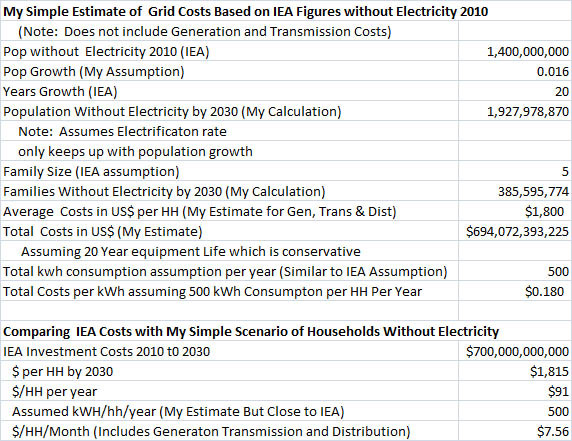 To see if these numbers make sense, I developed some estimations of my own combined with those of IEA (see Figure). Let’s say that the number of households without electricity grows at an average rate of 1.6% per year. Due to population growth this would mean electricity growth mirrors population growth and approximately 875 million new households would gain access to electricity. However, at the same time those without electricity would grow by over 500 million and would reach 2 billion people by 2030 or about 400 million households. Most current scenarios call for the number of people without electricity to be approximately 1.3 or 1.4 billion by 2030, but for investments purposes I will use as the baseline for investments the figure of 2 billion people by 2030 because it represents the growth of existing populations without electricity that are mostly in developing countries. Using some rules of thumb, I divided 700 billion by 400 million household and by 20 years. The result is that this investment turns out to be 91 dollars per household per year or around 7.56 dollars per month. So the estimated investment cost for new households turns out to be about US$1800 per household including all investment costs such as generation, transmission and distribution. These figures should be somewhat high for the actual investment costs because this is for initial costs and much of the equipment will be installed later in the time frame and will last well beyond the 20 years. Anyway investment costs 7.56 dollars per household per month much of which would be paid for by the new consumers is not as daunting a figure as 700 billion dollars over 20 years. After that I looked at the investment costs from the point of view of investments and kilowatt hour consumption. Now I know that this is not correct, as the investments may last way beyond 2030, so the costs might turn out to appear high. As it turns out they seem very high. This confirms my suspicion that the equipment will last longer than the 20 year time frame. With 700 billion dollars divided by 953 terawatt hours is US$ 0.735 per kilowatt hour. Just to check this, I divided up the investments in grid, minigrid, and offgrid. The figures are seem perplexing with costs of grid equal to US$ 0.68 per kWh, for minigrid it is 0.79, and for offgrid just US$ 0.367. Most offgrid solar home systems I know of today generally involve cost of about US$ 1.00 or more per kilowatt hour so those figures seem low. If I have these figures wrong, I am glad to correct them. I think the point I am trying to make is that more information needed to be given in the report to make the 700 billion dollars seem more credible. I do not know whether the details are available in World Energy Outlook, but they should probably be in this report. They do have an background methodology available, but despite a nice writeup there is not much on basic assumptions of costs or population growth. 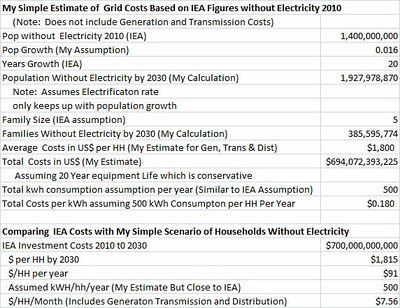 Also, most of these costs should be paid by consumers as part of their electricity bills. After all poor people without electricity are already investing their hard earned money on poor lighting fuels such as kerosene. One could come up with an very large number for kerosene, candles and battery use among the estimated 1.4 billion people without electricity in the world. Poor people without electricity often spend one to two dollar a month for a couple of liters of kerosene for lighting. Assuming one dollar a month over 20 years this would be in undiscounted terms close to 70 billion dollars up in smoke. This is my fist look at the investment costs and it is without any inside knowledge of how these figures were calculated. However, they seem to be the total investment costs of new consumers by 2030 for equipment that may last well beyond that year. Having done this myself for other reports, I recognize that there are always issues when making such long term predictions. The numbers are dramatic and emphasize a good point. But it might be even more important to show how affordable and solvable the problem really is! I am sure I have raised some questions here. Comments are obviously welcome. In the mean time answer the following poll. The IEA figures for energy access remain the primary reference for those of us working in this topic. The WEO 2010 had a full Chapter focused on this area which was done in cooperation with the UN. This material helped trigger a number of ongoing discussions and new research. Last year we decided to look a bit more carefully at the investment figures in order to underpin some of our ongoing work. Together with a few colleagues, we have also “looked behind the numbers” in Understanding the Scale of Investment for Universal Energy Access (see reference below). Our motivation for doing this was twofold: A) to better understand and bring transparency and comparability in the various estimates published in the literature, including those from the IEA, and B) to test an intuition that the figures used commonly could be underestimating the overall scale of spending required. We disaggregated the estimates available in the literature for the purposes of comparison, with the information available. The wide variations provided the impetus to examine their scope, and consider the underlying algorithms and assumptions. For instance, we noted that the studies give little attention to recurrent costs such as operation & maintenance (O&M) as well as fuel costs, and that most of them focus on the supply-side (for electricity). With those findings in mind, we built a simple algorithm based on levelized costs to compute the cost of meeting universal electrification by 2030. The methodology is highly stylized, but aims to be useful in terms of transparency, comparability, and as a basis for more sophisticated estimates in the future. We also consider cooking costs and present a total figure for both service areas. We conclude that the cost of providing (near) universal access to modern energy is likely to be considerably higher than published estimates which often focus primarily on capital costs. While recognizing the coarse nature of our analysis and its sensitivity to major assumptions, we find that the annual cost of universal access to electricity and clean cooking ranges from USD 14 to 136 (USD 12 - 134 billion for electrification and USD 1.4 to 2.2 billion for clean cooking). Bazilian, Morgan, Patrick Nussbaumer, Erik Haites, Michael Levi, Mark Howells, and Kandeh Yumkella. 2010. Understanding the Scale of Investment for Universal Energy Access. Geopolitics of Energy 32, no. 10: 19-40. Available here: http://www.unido.org/index.php?id=1000598. Classic study of transition from traditional to modern fuels in urban areas. This is a review of lessons learned from most successful states in India's legacy improved stove program. The Basics of Wood Burning Stoves: A Case for Standards or Rating Systems? Solving Rural Electrification Problems: New Wine in Old Bottles? What is Rural Electrification: New Technologies and Old Definitions? Energy for Development and Poverty Reduction by Douglas Barnes is licensed under a Creative Commons Attribution-NonCommercial 3.0 Unported License.